The Stewart Historic Miniatures Collection at the Frazier History Museum is one of the largest collections of historic miniatures on permanent public display in the world. Made possible thanks to a generous donation from Charles Stewart, whose love of toy soldiers began as a boy and continues today with a collection of over 30,000 world class figures representing approximately 180 historic makers. The Stewart Historic Miniature Gallery Guide is an invaluable tool for enjoying the collection on site. Many of the rare and distinctive figures in the collection have been featured in several issues of Old Toy Soldier magazine. 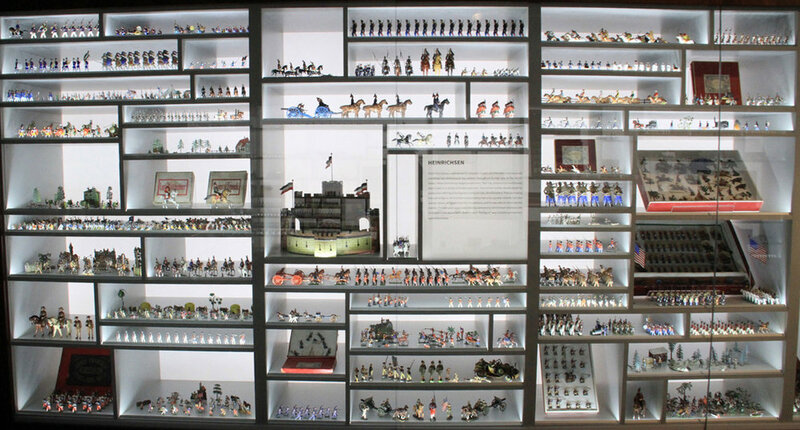 The collection is housed in custom made display cases, pictured above is a section dedicated to German makers of toy soldiers. The toy soldiers and miniature figures are arranged according to important makers, and manufacturing country. Detail of the terrain table and soldiers in The Charles Stewart Gallery for all to play with. Renowned author and auction house expert, Norman Joplin, worked with the Frazier to analyze and assess the collection and provided input on its display and interpretation. As editor of Old Toy Soldier Magazine, a worldwide resource for historic miniature collectors, Joplin is a British Citizen who has been granted permanent residence status in the United States based on his exceptional ability in a specialist field of knowledge in connection with the Social History of toy figures as viewed through the eyes of children’s toys during the period 1893 to 1966. Click here for Joplin’s analysis of The Stewart Collection from 2016. With over 30,000 toy soldiers in its collection and over 10,000 on display, The Stewart Historic Miniatures Collection brings the toy soldier experience out from behind the glass, and into the hands of children (both young and at heart) who simply want to play. The exhibit allows visitors to browse makers, styles and periods of treasured miniatures, while using their imaginations to experience a tiny world of play though hands-on interaction. Among the low-slung cases mounted along the first floor’s perimeter are sets that bear some relationship to the state of Kentucky, bridging the gap between toy soldiers and local history. One, a set of tin flats, originally belonged to a young Robert Worth Bingham, the scion of a Louisville media dynasty who grew up to become a judge, a publisher, and, from 1933 to 1937, the US Ambassador to the United Kingdom. A second set, a Barclay diorama of eleven racehorses, made c. mid-20th century and repainted in 1992 by Dr. William J. Schneider, honors the ten (eleven due to tie) fastest Kentucky Derby winners. 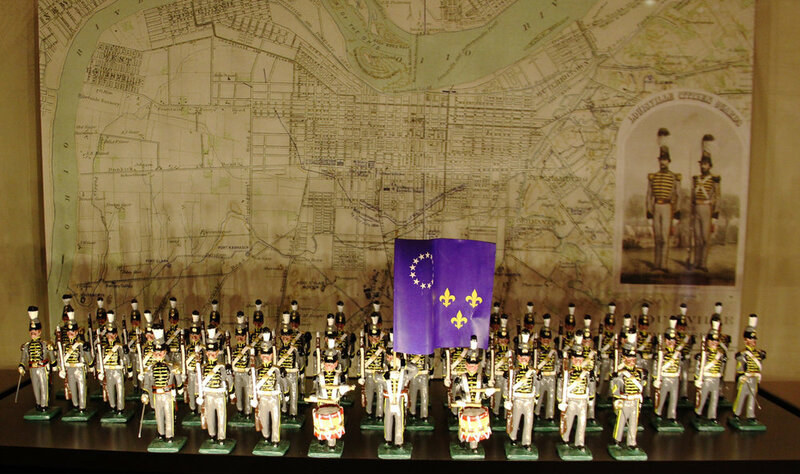 A third set, specially commissioned for the Frazier in 2011 and gifted by Morton Sachs, depicts the Louisville Citizens’ Guard, c. 1858, in formation behind its fearless leader, Captain Simon Bolivar Buckner. The Kentucky Derby diorama depicting the fastest 10 horses in Kentucky Derby history between 1930 and 1950, 11 horses featured as 2 horses ran the same time. Made by Barclay Manufacturing Co. of New Jersey. Painted in 1992 by Dr. William Schneider. The Louisville Citizen's Guard, 1858-1860. Specially commissioned for the Frazier in 2011, a gift from Morton Sachs. Detail of the Louisville Citizen's Guard Unit Made in 2011 by Martin Ritchie Mfg. The Stewart Historic Miniatures Collection contains a comprehensive example of the different kinds of materials in the manufacture of toy soldiers: lead, tin, composition, paper, wood, and plastic. Unknown maker, Germany. Demi Round Scottish figures. Unknown maker, Germany. Red Coat Flats. Milton Bradley, United States. Black Watch Set. Dufor, France. Large scale French figures. Unknown maker, France, French sailors, c. 1850-1860. Before William Britain revolutionized the industry with the hollow-casting method, toy soldiers were hand-made by metalworkers — certified craftsmen who could shape figures out of tin, lead, or pewter. A wide variety of these early masters are represented in the collection, including Allgeyer, Ammon, Besold, Denecke, Heinrich, Heinrichsen, Heyde, Lezius, Lorenz, and Schildknecht of Germany; Cuperly, Blondel, and Sandre of France; and Erik Lodin of Finland. Founded in Dresden, Germany in the 1830s by Gustav Adolf Theodor. It was not until 1872 when Georg Heyde took over and obtained a license to become a toy trader that the company’s products became the Heyde items that toy soldier collectors recognize today. Georg Heyde became the leader in producing a diversity of figures in huge display boxes containing up to 150 figures. Subject matters covered a vast range from Roman Legions to German infantry units to Native American warriors, all of which were rendered in industry leading, stunningly active poses. The flair and extensive variety of sets offered by Heyde made them the leading exporter of toy soldiers in the world until WWI. Heyde continued limited production after the war up to 1944, but the partial destruction of the factory and the political climate of WWII forced the company to end production completely. The Märklin "Deutchland", WWI German Battleship, 1912, 34 inches long. Malcolm Forbes Collection. Dimestore figures are American made toy soldiers that sold individually in five- and-dime stores such as Kresge, Woolworths, and Ben Franklin. Minimally painted hollow cast figures measuring 3 inches in size, they were made to corresponded with American made standard gauge toy trains of the time. The popularity of the toy soldier reflected public interest in wars around the world and America’s own military preparedness of the era. By the 1970s, Dimestore soldiers were replaced by plastic "army men" toy soldiers. Grey Iron Casting Company located in Mount Joy, Pennsylvania, was the first major Dimestore toy soldier maker and was the only company to produce 3 and 3 1⁄4 inch iron toy soldiers. Production began in 1933, with the introduction of 35 different soldiers. Manoil Manufacturing Company was founded in Manhattan in the late 1920s and began toy soldier production in 1935-1936. Their earliest figures were “hollow base” design, which featured a concave base. The largest manufacturer of Dimestore figures was the Barclay Manufacturing Company. Barclay and their competitors kept prices at about five cents per figure, making them affordable to children. The figures were made of 87% lead and 13% antimony. Among the rarest and finest American made toy soldiers are those of the Warren Lines. John Warren Jr. founded the company in Brooklyn in 1935 and quickly achieved notoriety for his well-crafted figures. It is speculated that Warren recruited sculptress Margaret Cloninger to improve the improve the artistic quality of his line. With Cloninger on board, Warren figures rivaled their European counterparts artistically and anatomically. The partnership worked so well that Cloninger and Warren eventually married. In the United States, however, Dimestore figures proved too popular and the higher price and sophistication of Warren figures did not draw buyers, forcing the company to close in 1941. Founded in 1859 in Göppingen, Germany, Gebrüder Märklin, or Märklin, as it is known today originally specialized in dollhouse accessories! The maker is currently renowned for its model railways and technical toys. During WWI, as Britain and Germany raced to build bigger and better ships, toy makers followed suit building complex and sophisticated wind up tin ship models that were raced around ponds by children around the world. The toy ship craze was so popular that when a groundskeeper drained the pond in London's Kensington Gardens in 1923, he discovered 150 sunken vessels at the bottom! German WWI Submarine with brass windup key, 1915, 22 inches long. Made by Märklin. Barclay, United States, 1935-1951. West Point Cadet Dimestore Figures. Gustave Vertunni settled in Paris where he began making his famous line of detailed single portrait historic figures. He meticulously sculpted each original from which the molds were made. His wife, along with a handful of assistants hand painted each figure, resulting in a singular artistic rendering that blurrs the distinction between toy soldier and sculpture. Vertunni created the forerunner of the modern connoisseur figure by selling his detailed characters individually, rather than in large uniform groups. Established in 1839, the Heinrichsen Company at a time when Germany was exporting two- dimensional toy soldiers throughout Europe and to the United States. When Heinrichsen began production, “flat” toy soldiers had traditionally been made in a variety of shapes and sizes. Heinrichsen boldly standardized his production offering all his figures in only one size, 28 millimeters. Thus, by making one size of figure, Heinrichsen could produce not only a greater volume, but also a wider variety of figures than his competitors, and he was able to dominate the market. The company was so successfully operated by Heinrichsen relatives until it closed in 1940 due to WWII, that the term “flat figure” was virtually synonymous with Heinrichsen.